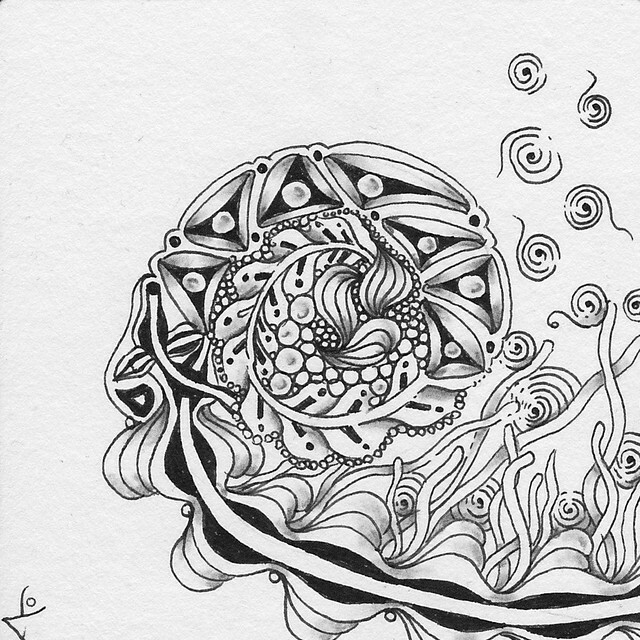 If you’re familiar with Zentangle, you probably have already stumbled upon the wonderful blog of the Tasmanian CZT Michele Beauchamp. I’ve been following her blog for many years now and since the first time I saw her art, I always admired her beautiful, elegant, airy, free-flowing style. You can imagine how thrilled I was when I read about her giving a Zentangle workshop on “Organic” in Beate Winkler’s studio in Hamburg, Germany. Right now, Michele is travelling through Europe with her husband Paul and made a short stop in Hamburg to meet Beate and to give this workshop. Beate is a CZT, too, and you can find her blog and a post about this workshop including many pictures of everybody and the group’s work here. Of course, I decided to sign up immediately because I just knew this might be this famous ONE chance you cannot possibly miss. Before the workshop I tangled more frequently than before to get into the groove again. However, the beginning of the day the workshop was to be held on was not very Zen-like.. My bus to the train station arrived early and I only had the time to wave it goodbye. After a forced march I only barely caught the last train and the last (other) bus to the main station where I arrived just in time for my train to Hamburg. That was a close one! My tile from the warm-up using Hollibaugh (tangleation with Quipple), Keeko, Opus, Paradox and Zinger – I really like how Zinger and Hollibaugh are weathing together. When we arrived for the workshop, I was very happy to find out that Michele is a very amiable person. It was a real pleasure to meet her! The workshop was scheduled for four hours. However, it felt like barely a few minutes although we tangled two tiles and a bookmark. It definitely didn’t feel like such a long time at all! In all, we were 15 people not only from different cities in Germany but also from different countries. Most of us came from Germany (from Hamburg as far as Würzburg! ), but three tanglers came as far as from the Netherlands and one from Belgium – wow! Among them were quite a few CZTs, but other, much less experienced tanglers were present and had their share of the fun, too. After this tile and a short break we continued with a bookmark. We tangled a very free-flowing version of Yincut and I must say I like it! Yincut hasn’t really crossed my tangling path before and it didn’t look very special or interesting in the beginning. 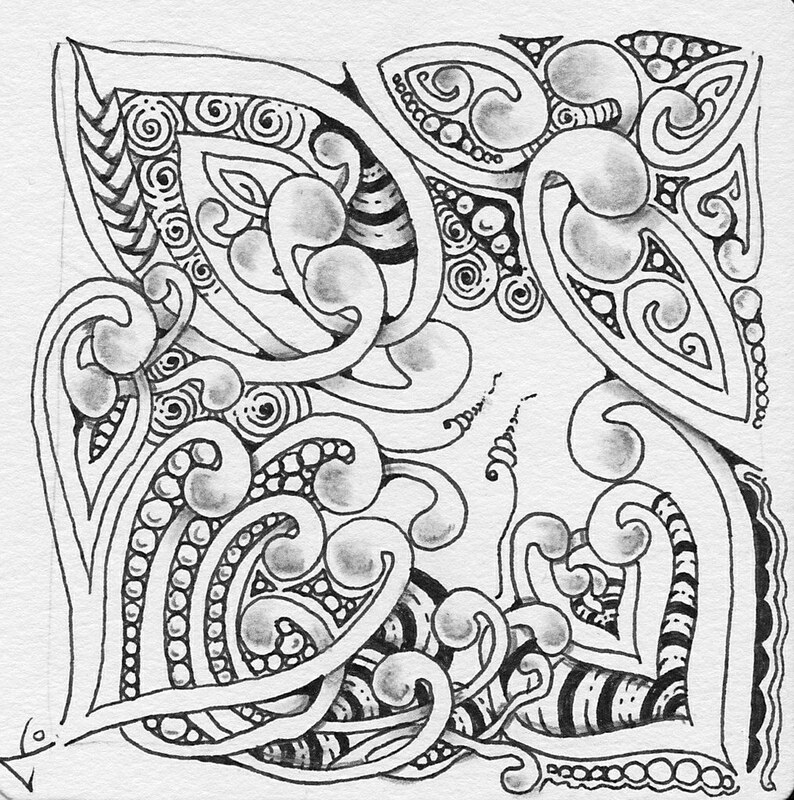 But that’s what I ike about Zentangle, it’s a constant surprise! Playing with tangles really is a lot of fun and I decided to look at a few tangles in-depth more. It is such fun! 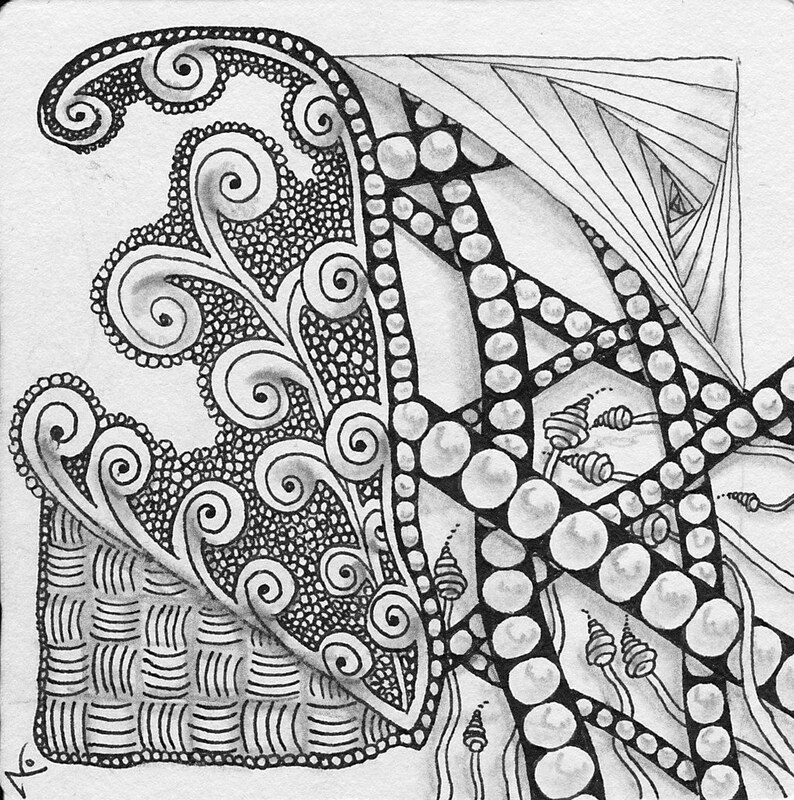 Here is my bookmark – I really like how the grid-Yincut turned out, but the free-flowing “onions” of it.. well, I guess its ok, it’s Zentangle after all! The tangles we used were Yincut, Sprigs (the “onion”, one of Michele Beauchamp’s tangles) and Zinger. I added some Ahh on my bookmark, too. Tangles used: (can’t remember the center..), Tipple for filling the gaps, something that was supposed to be Finery, Tripoly, a TOTALLY messed up Finery that I turned into something you might call a tangleation of Crescent Moon or maybe rather something totally different (the string with the onions), Grass Border and Printemps. Unfortunately, I didn’t take any more pictures of the meeting and not even with Michele (which I now regret very much). But as already mentioned before, you can see more pictures of the workshop on Beate’s blog (see above for the link). I had lots of fun in this workshop, it was great to meet so many tanglers and, of course, Michele in person! She even gave me one of her ATCs after the workshop! I’m really happy about it and feel so honoured! ❤ It’ll get a nice spot in my ATC collection. You might remember seeing it in her last post before coming to Europe), it is the first ATC of the two ATCs. Thank you again, Michele, for this wonderful workshop, it was a pleasure to meet you in person! And thank you, too, Beate, for making it all possible and for your hospitality!